RICHMOND HILL, ON, Aug. 9, 2016 /CNW/ – From being named a finalist for World Car of the Year and Canadian Car of the Year, to receiving numerous awards for the quality and sophistication of its interior, and winning countless comparison tests, the current-generation Mazda3 has become a standard by which compact cars are judged. Now it’s time to up the game, again. Mazda Canada Inc. (MCI) today introduced the Canadian-spec 2017 Mazda3, which gains notable improvements in refinement, packaging, and handling. 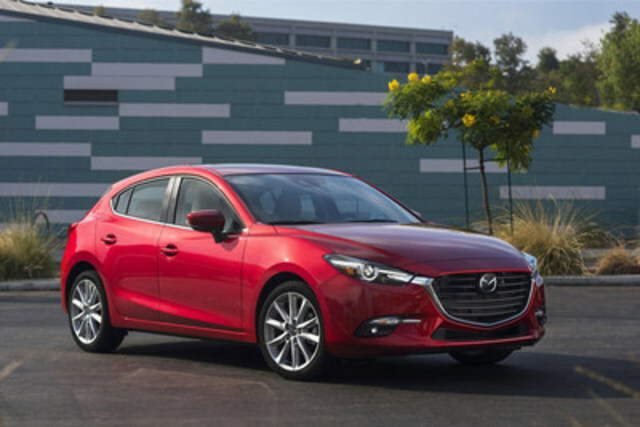 The 2017 Mazda3’s exterior tweaks are subtle, but effectively elevate the vehicle’s KODO—Soul of Motion design, adding a bolder grille, available LED headlights and tail lights, and a redesigned rear bumper on five-door Sport models that extends an upscale, monochromatic look to the lower valences. Occupants are treated to a refined interior worthy of a luxury brand price that should have anyone seriously questioning the need to go for a more expensive offering from any other car company. Perforated black or pure white-coloured leather seating surfaces are available. The 2017 Mazda3’s leather-wrapped steering wheel has been redesigned for a more comfortable grip, and is newly available with heating elements, a rare feature in its class. Other interior improvements include an available electronic parking brake which frees up space for storage, and a sliding covered center console design borrowed from its big brother, the Mazda6. Front passengers are treated with storage space in new door pockets that are three times larger than in previous models. Much as Mazda3’s already engaging steering has improved with GVC, Mazda’s engineers have upped the ante with improved NVH damping, too. The 2017 Mazda3 is a substantial 3dB quieter at 40 km/h (25 mph) over rough roads, thanks to tighter body gaps, improved sound insulation and redesigned weather stripping versus its 2016 predecessor. With the 2017 updates also comes the adoption of available Advanced Blind Spot Monitoring, Traffic Sign Recognition, and Mazda Radar Cruise Control along with a new, full-colour Active Driving Display. These safety features complement Mazda3’s i-ACTIVSENSE suite, which also includes Rear Cross-Traffic Alert, Smart City Brake Support, and Smart Brake Support for highway-speed accident avoidance. The 2017 Mazda3 arrives in dealers this fall, with pricing and packing to be announced closer to its on-sale date.